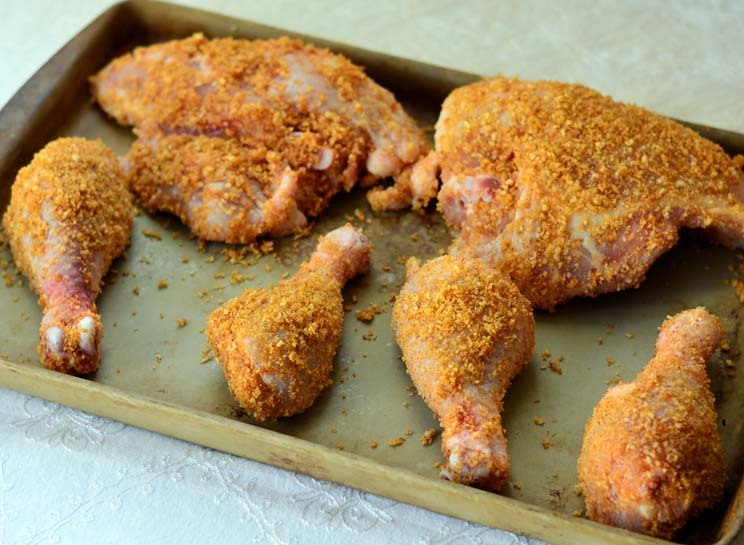 Baked chicken is always a family favorite and it's even better with nice, crunchy skin. An easy homemade shake and bake mixture makes this baked chicken‘s skin get extra crunchy and tasty. 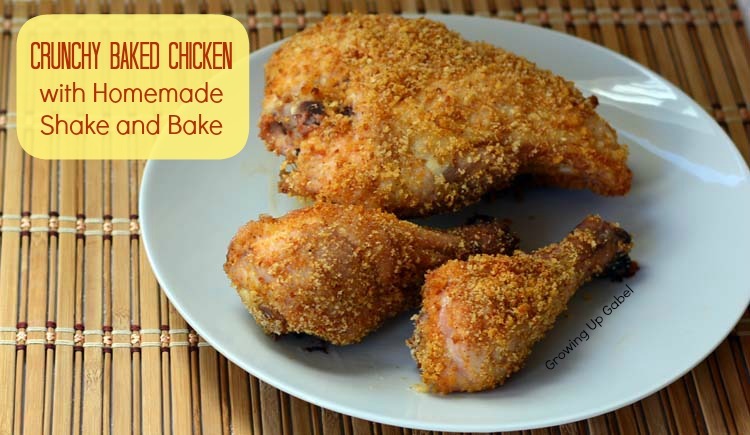 Baked chicken was one of my favorite dishes my mom made when I was growing up. My mom made her crunchy baked chicken by covering the chicken with crushed Rice Krispies. It was really good but I was always a little jealous of my friends whose moms used the boxed crunch topping from the store. The TV commercials made it look so delicious. So one of the first things I bought for my kitchen pantry when I was on my own was the boxed crunchy topping. It was just as good as I imagined. Once I got married and had kids, though, I realized that the store bought topping was kind of expensive and didn't really have all that great of ingredients. Then one day I stumbled upon this crunchy topping recipe in one of my all time favorite cookbooks – the More With Less Cookbook. I couldn't believe that I hadn't thought to make my own topping. I did tweak the recipe a tad by leaving out a few ingredients and adding garlic. The oil seems a bit odd, but it helps the mix brown up when baking. It does make for more of a wetter mixture but that doesn't seem to affect flavor or storage. I've stored leftover for months in the fridge. My favorite way to use this mixture is on baked pork chops and we've also used it on fish. Just adjust your bake time down a bit for the fish. If you loved baked chicken, make sure to check out my Amish Baked Chicken recipe for an oven baked chicken that tastes fried! Combine all ingredients except the meat in a large bowl or quart canning jar. Mix together thoroughly with a fork or shake the jar very well. Mix can be stored for a few months in the fridge. When ready to use mix, remove 1/2 -1 cup of the mixture to a shallow dish. Rinse meat with water to get just a tad wet. Coat each side of the meat in the mixture. Add more mixture as needed until all the meat is well coated. Bake chicken and pork chops at 350 degrees for 45-60 minutes or until cooked thoroughly. Fish will take less time, around 30 minutes. You may need to grease your baking dish. My stepson cannot eat corn and loves breaded chicken. I used corn free bread crumbs and it was a hit. Made this last night with chicken legs I had in freezer and was great. Definitely moving this recipe to my “Tried and True” board. Thanks! Used this week on boneless pork chops. Turned out perfectly. I had stored the leftover mix from the last time in the freezer so dinner was prepared in a flash. Again, thanks! Tried as I was out of S&B. So easy and as tasty as an be! Thanks for a great money savings trick. I have found if you wet the chicken, it sticks pretty well. Then I pat more on once it’s on the baking sheet. I made it tonight and it turned out great,no problem with getting it to stay on the chicken. I will make it again. Thank you for the recipe. I’m sorry that happened. I’ve never ever had that happen in 10 years of making the recipe. I always use avocado or olive oil, if that helps! Coat the chicken itself with oil then place it in the bag and shake. I don’t have bread crumbs on hand but I do have Panko do you think that this would be an ok substitute? 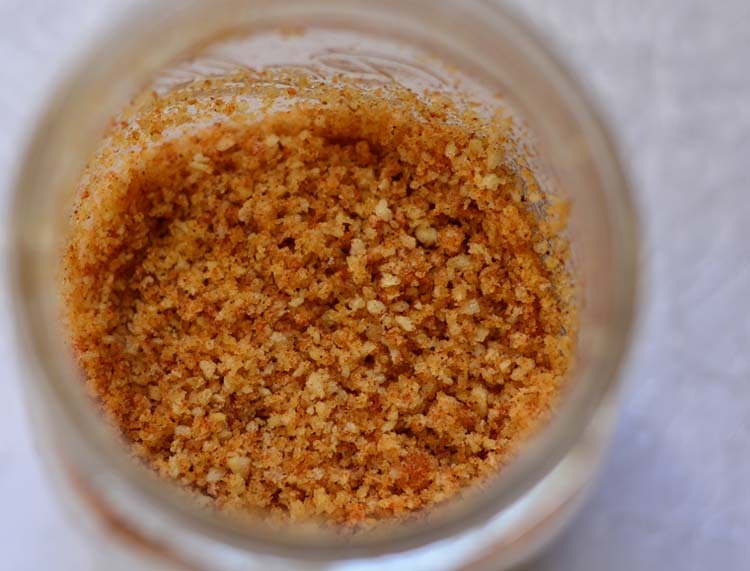 You can always grind up heals of bread or dry toast in food processor or old fashioned grinder thus making your own bread crumbs. Living out in the country I’ve discovered all sorts of cooking emergency replacements. To answer your question Panko, although different than bread crumbs, should work well in this recipe. Looks really good! I used to love shake & bake as a kid. I need to make this. Pinned & shared. Thanks for joining the Inspiration Spotlight Party! I always have bread crumbs in the house. So easy to make now. Thank you so much for sharing with Full Plate Thursday and have a fun weekend! This looks GREAT! I need more chicken recipes and I try to stay away from frying chicken to keep it more healthy. Can’t wait to try this. Found you from the Melt in Your Mouth Sunday link up party. And glad I did! How I wish I could put a bite on those crispy baked chicken. Great recipe! Gah! How have I not thought of this before? What a great idea! Love that you made your own Shake N Bake. Crispy baked chicken is the best, and we don’t think to make it nearly enough over here. Your post brought back many memories. I think we all remember those commercials and the little girl at the end going “And I helped!” Your remake sounds delicious and your photos look just like what I remember. I love this idea. Anything made cheaper, easier and healthier gets 2 big thumbs up from me. And you can’t go wrong adding garlic!! Thanks for sharing with the Crunch Bunch at #Sunday Supper! How can they charge so much for something so simple?! This is fantastic! Ha! I just made this last night! It’s one of my favorite no-fuss meals! Perfectly simple! Great #SS recipe. I looooove that you made everything, including the shake and bake, from scratch! Crispy, crunchy, yummy looking chicken!! Everything tastes better when its homemade. Great recipe! Love the homemade shake and bake- fabulous!! 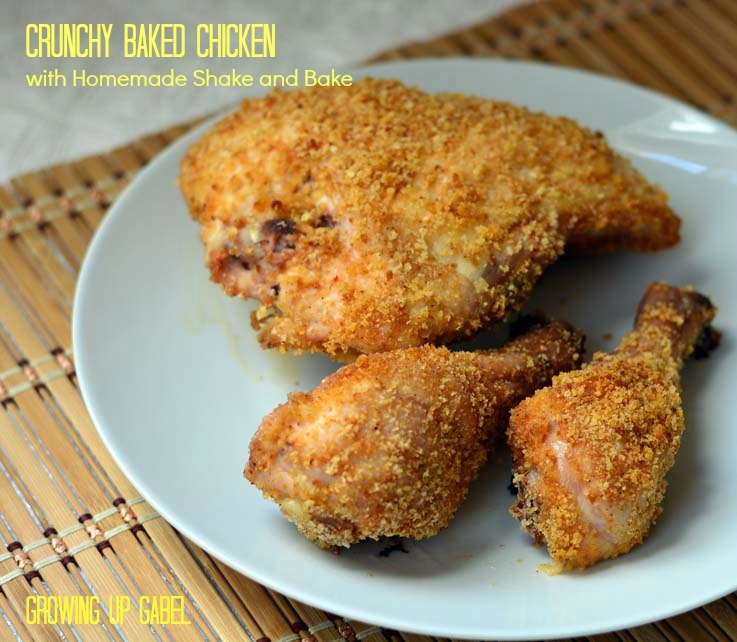 Can’t wait to try this Crunchy Baked Chicken….looks so tempting! I love this so much more than shake and bake! My parents would not get shake and bake and so I always wondered what it tasted like. To be honest, I’ve never bought a box of it either. I prefer homemade coatings like yours. Nice mix of spices in it. I was that lucky kid who got fed shake and bake! I loved it when mom made it for dinner and your version looks identical to what I grew up with, but I bet it tastes so much better than the box mix! Your coating looks exaclty like shake and bake! i can’t wait to give it a try! Homemade shake and bake, I love it! I haven’t had that in years! Love the recipe! Yeah, my mom would never buy Shake ‘n’ Bake either! We had the Rice Krispie version as well…which we never scoffed at. BUT yours homemade crispy chicken sounds better than both those options. Easy and delish! Shake ‘n Bake is so nostalgic. Visiting my mom on summer vacations from Tokyo, I loved wandering the American supermarkets. Somehow Shake ‘n Bake was always a curiosity. Mom was more of a tennis player than cook so I don’t recall too much of the lovely stuff. But thanks to you I can now make my own and hopefully fry up some chicken as good looking as yours! Chocolate Chip Cookie Brittle ~ Crunchy Goodness #SundaySupper!